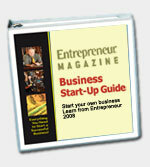 BusinessMart.com strongly recommends Entrepreneur Magazine's Event Planning Business Start-Up Guide. For more information read below. To purchase this book click on BUY NOW. Are you the one who always organizes family get-togethers, birthday parties, evenings out with friends or school events? Are you detail oriented, enjoy people and have a good imagination? Then you have what it takes to be a highly paid event planner. And this easy-to-use guide will show you how. Youï¿½ll also learn how to bring in more money by specializing in certain of types events. Youï¿½ll even hear from successful event planners, gain valuable insights from their experience and learn how to avoid common mistakes. Getting started is easy. All you really need is a computer, a phone and your imagination. You can run your business from your home. And you can make very good money working either full or part-time. In fact, according to recent research, spending for special events in the United States is at least $800 billion annually. If youï¿½d like to make a good living doing something you enjoy, order your guide today.